From Wall Street to Main Street, entrepreneurship is being heralded as the growth engine that will save our economy. Business Strategist Carol Roth believes that indeed small business has the potential to create growth in jobs and GDP, but only if those small businesses succeed. Although many tout that there’s never been a better time in history to be an entrepreneur and launch a business, that conventional wisdom only holds true if entrepreneurship is right for you, plus if it’s the right time for you and the right opportunity for you. Now it’s time to take off the rose-colored glasses and do the necessary preparation before you invest your precious time, money, and energy in launching a business- or even tweak your existing business model- so that you can have the best chances for success. Identify and evaluate the risks and rewards of a new business—or even reconsider a current business—based on your goals and circumstances. Click Here to Order The Entrepreneur Equation Now! 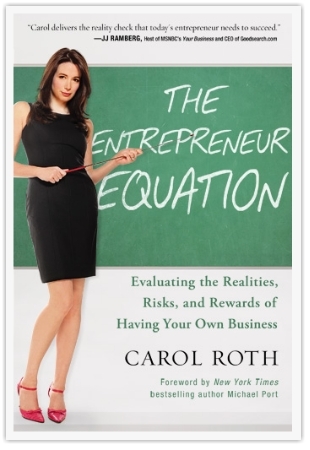 “The Entrepreneur Equation is the reality check you need, plus the entrepreneur success toolkit you want—a must read!